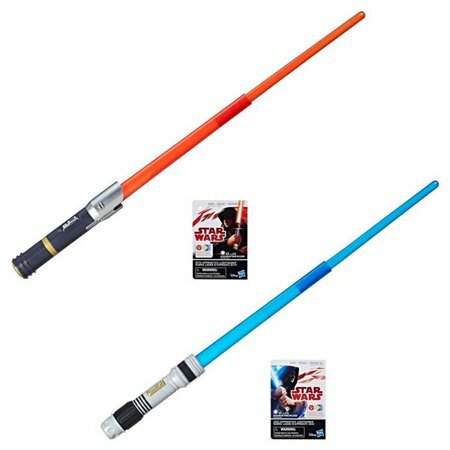 Walmart has debuted a brand new Last Jedi themed item: an electronic apprentice lightsabers set! This set costs $61.97 plus $8.20 for shipping. As if this writing there’s only 5 of these lightsaber sets left in stock so order soon. Discover a galaxy of starships and vehicles, and get immersed in exciting stories of good versus evil against a backdrop of a universe populated by heroes, villains, droids, and space creatures with the Star Wars Electronic Apprentice Lightsabers! Skillfully wield the Apprentice Lightsabers and activate light effects to imagine training as an apprentice. Flick to extend blade and press button to activate lights!